Charter Challenge – We need a national housing strategy now! Who was involved in the case? In Toronto, Ontario, on May 26, 2010, a historic legal case was launched. The applicants in this case faced the broad spectrum of inadequate housing: some have been or are currently homeless, some are living in homes that aren’t suitable for their families or which do not accommodate their disabilities, and some are afraid of being evicted because they can’t afford the rent but the apartment was all they could find. The human rights and housing organization – Centre for Equality Rights in Accommodation was also involved, representing their members who have faced discrimination in rental housing and homelessness. Lawyers from the private bar (Peter Rosenthal and Fay Faraday) and the Advocacy Centre for Tenants Ontario represented the applicants in this case. Homelessness in Canada has reached crisis levels. The federal and provincial governments have created this national emergency by cancelling programs and funding, and by failing to ensure that existing programs and policies effectively address homelessness and inadequate housing. Canada is one of the few countries in the world without a national housing strategy. Canada’s failure to respond to the homelessness crisis is in violation of its international commitments, including the Universal Declaration of Human Rights. It also violates the Charter of Rights and Freedoms and specifically, s.7 which guarantees the right to life, liberty, and security of the person and s.15 which guarantees the equal protection and benefit of the law without discrimination. The applicants were asking for more than simply the right to shelter. Under the Charter, people in Canada have a right to adequate, affordable housing. The court was being asked to declare that homelessness and inadequate housing violate the Charter of Rights and Freedoms, and that the government must develop a national and provincial strategy to end homelessness. What has happened with the legal case? On June 25, 2015, the Supreme Court of Canada upheld a controversial lower court decision and ruled that the Charter challenge holding governments responsible for the crisis in affordable housing and homelessness would never be heard in Canadian courts. It’s important to spark public imagination to think about the issue of housing differently. The litigation was one part of a broader project of education, organization and mobilization which resulted in people all across Canada talking about housing as a human right, and calling for a national housing strategy. Our demands have finally been heard by the federal government in their announcement of a National Housing Strategy in November, 2017. 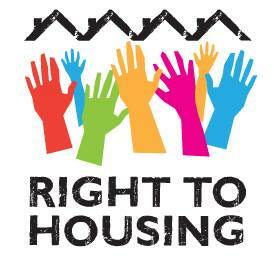 With that announcement came the promise of legislating housing as a human right, but we are still waiting. The Right to Housing Coalition continues to push to ensure that the voices of those with lived experience of homelessness and precarious housing are included in the process.